Are you ready for this? Guests are welcome to join make up artists and product specialists Jen Coakly and Emily Roeserto to discuss and showcase products from Inglot Cosmetics during this fun beauty event. 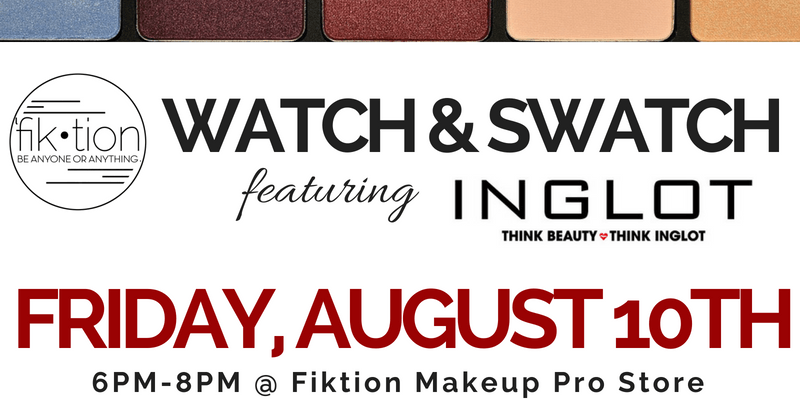 The Fiktion Makeup Pro Store will be hosting a Watch & Swatch event featuring Inglot Cosmetics Friday, August 10th from 6pm to 8pm where Coakly and Roeserto will showcase the product’s versatility and ease of application. Fiktion is a retail store located in Troy, MI, inside Multimedia Makeup Academy. The store retails makeup products and tools to both professional artists and makeup enthusiasts, providing them the convenience of purchasing pro products locally. At ‘Fik•tion, customers can see, touch, and test products that are typically only offered online. In addition, the company has an e-commerce platform where customers can easily make their selection and have their products shipped directly to them. ‘Fik•tion is the only pro makeup store of its kind in Michigan and is open to the public. During the event, professionals will also discuss and show tips and tricks when working with the products and will cover everything from the basics to the most advanced techniques. Not only will you learn about the products, you’ll be able to swatch and test them out for yourself! The good news? All attendees will receive a beauty goodie bag! Click here to register!